Home EDUCATION Government to spend Sh. 4.2B in this year's KCPE, KCSE, assures of the authenticity of the exercise. Government to spend Sh. 4.2B in this year's KCPE, KCSE, assures of the authenticity of the exercise. Education PS Belio Kipsang hands over examination materials to one of the school principals in Thika West Sub-County. Looking on is AG Kihara Kariuki (holding a bundle of exam materials), Thika West Sub-County Director of Education Ronald Mbogo (partly hidden), Thika West DCC Douglas Mutai (extreme right). Education PS Belio Kipsang has emphasised on the need to create adequate confidence among professionals in the teaching faculty in a bid to reduce the huge investment during the delivery of examinations. This year alone, the government invested sh 4.2 billion for management of national exams and close to sh 1 billion will be spent to pay the 264, 446 field officers who include centre managers, supervisors, invigilators and security agents with another sh. 2 billion going to the examination markers. The balance is expected to be used in logistics such as hiring of choppers fueling vehicles as well as paying allowances to various government officers involved in the exercise. 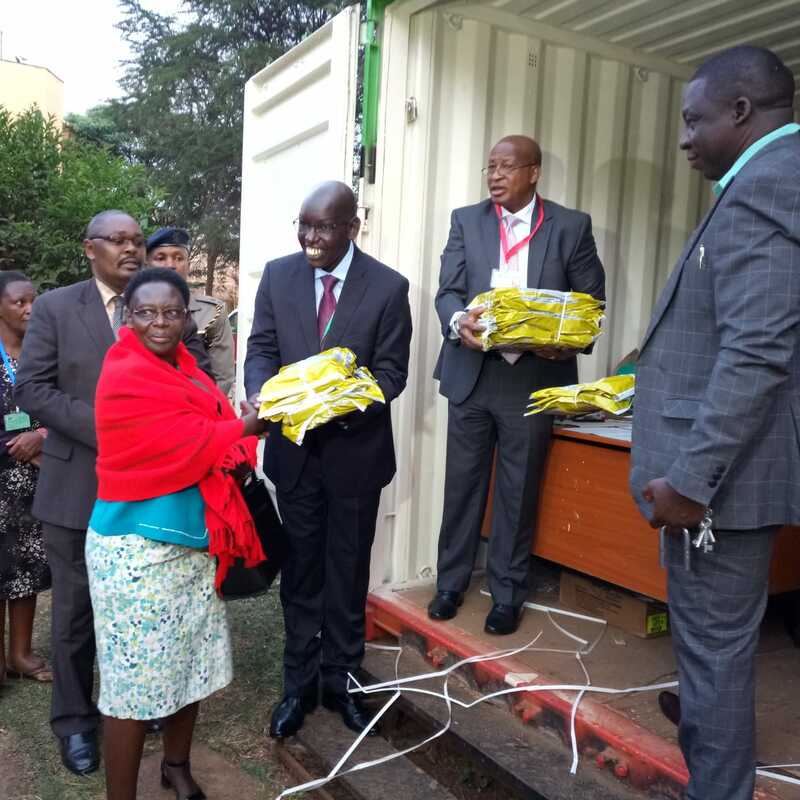 Speaking at the Thika examination center where he opened exam container, Kipsang said going forward, the ministry will not have to go through the long process of witnessing the opening of examination containers. He emphasised on the need to instill confidence among the examiners where in coming years, the examination will not be given so much focus and attention. He said for the last three years, there has been tremendous improvement on the way examinations has been managed, terming this as a clear indication that the sector is moving towards the right direction. Kipsang challenged parents to responsibly play their role of giving their children an opportunity to give their best. He also called on teachers to give the students an opportunity to give their best instead of focusing on what they think the students should deliver. However, he blamed the society for expecting too much from the teachers adding that this exerted pressure on these tutors forcing some schools to employ unorthodox means to meet the set targets. He assured Kenyans that all was well in the 12,000 examination centres around the country noting that cases of exams malpractices had drastically reduced. He assured Kenyans that those contracted to do the marking of these examinations will do their work professionally and that the results will be translated from the script and the knowledge acquired in their respective schools. He commended the media for conducting themselves professionally and engaging with the society during their reporting on exam matters adding that this has played a great role in ensuring the country moves in the right direction. Those who accompanied the PS included Attorney General Kihara Kariuki, Thika West Sub-County Director of Education Ronald Mbogo, Thika West DCC Douglas Mutai among others.